Finnish tenor Raimo Sirkiä is one of the most interesting dramatic tenors on the international scene. His powerful, warm-timbred voice lends itself equally well to Verdi's Otello and Radames as to Wagner's Tannhäuser, Tristan, and Lohengrin. Raimo Sirkiä has been a musician since his fourth year of life, when he began playing the accordion. He was the Finnish national champion four years in succession and went on to master several other instruments. Mr. Sirkiä studied voice at the Sibelius Academy in Helsinki. In 1981 he won the Timo Mustakallio Voice Competition and entered his first opera house engagement in Kiel, Germany. Here his lyric tenor repertoire widened to include Italian spinto tenor roles. Engagements at the Dortmund City Opera (1985-1991) and at the Deutsche Oper am Rhein (1991-1996) gave him the opportunity to add all the major Italian roles, including Otello, which he has sung all over Europe, as well his first Wagner roles, Erik, Parsifal, Walter von Stolzing, and Tristan. 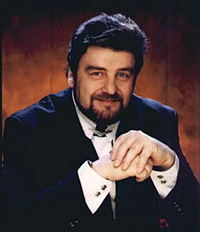 Since 1990 Raimo Sirkiä has also been a member of the ensemble of the Finnish National Opera. Notable among his roles in his home theater were Otello, a televised Don Carlos, and Siegmund in Gõtz Friedrich's production of The Ring. Mr. Sirkiä is a frequent concert guest with the major orchestras of Scandinavia and has recorded several complete operas, symphonies, as well as numerous solo recordings and complete operas on video. Raimo Sirkiä has sung at the Deutsche Oper Berlin, the Staatsoper Hamburg, the Royal Operas of Stockholm, Copenhagen, and Oslo, the Semper Oper in Dresden, the Teatro Malibran in Venice, and the Teatro Regio in Turin, the Otello Festival in Cyprus and the Bayreuth Festival. Mr. Sirkiä's Wagner repertory expanded to include Tannhäuser (Savonlinna Opera Festival) and Tristan (Deutsche Oper am Rhein) in 1996. Lohengrin followed in 1999 at the Megaron in Athens. Lohengrin was his début role at the Bayreuth Festival in 2000. Mr. Sirkiä has a long association with the Savonlinna Opera Festival, having sung the major tenor roles there since winning the Mustakallio Prize in 1981. He was named 'Artist of the Year' in 1996 in recognition of his contribution to the Festival. Raimo Sirkiä has been the Artistic Director of the festival since 2003.